I may have mentioned just a few times that this past winter was pretty brutal. So when warm weather finally arrived, I was ready for it. I wanted to spend as much time outside as humanly possible. 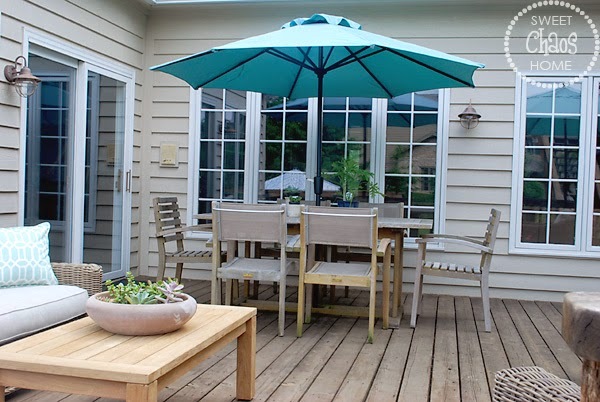 To take advantage of the great outdoors, I wanted to turn our deck into a "room" where we could entertain and relax. 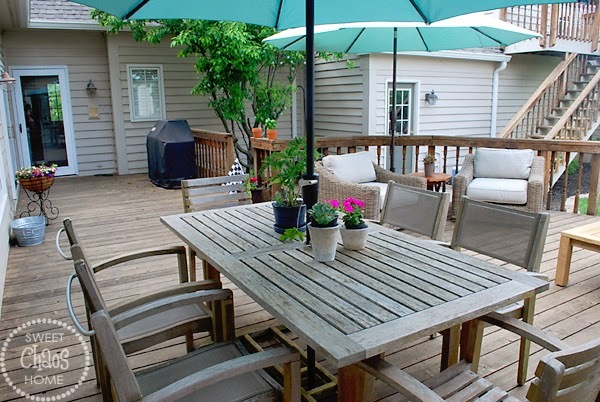 For years our deck furnishings consisted of a table and chairs, two wooden Adirondack chairs and a grill. It was fine for dining al fresco, but it didn't offer much in the way of comfort. When the Adirondack chairs fell apart, we wanted to replace them with something super comfortable. A sofa and two lounge chairs provide the perfect place to kick back and relax. It's no big secret that my thumb is not green. 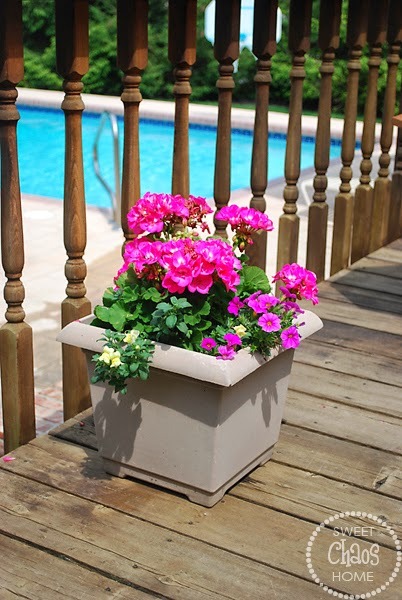 My flowers always start out looking good this time of year, and I always vow to keep them looking good through the hot summer. My success rate is dismal. Maybe this year it will be better. 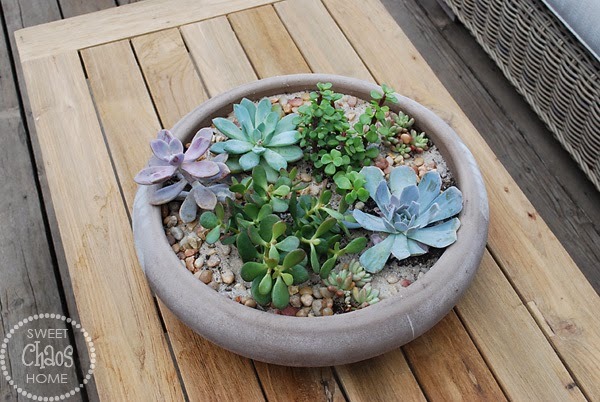 One of my favorite things I planted this year is a mini succulent garden. 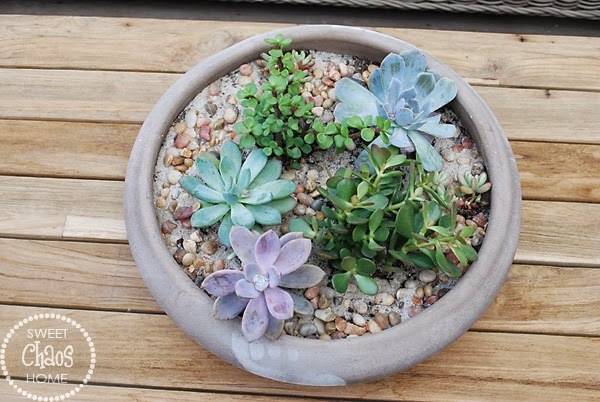 I found this shallow limestone planter at HomeGoods, and filled it with soil, sand, rocks and a variety of succulents. I don't know why, but it makes me so darn happy! 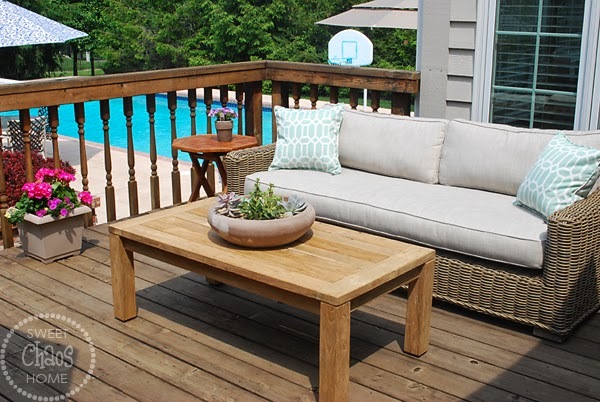 The teak coffee table was a steal at a local hardware store, and the teak side tables I moved outside from my sunroom. They will eventually weather to a gray patina. Our teak dining table and chairs were damaged in a hailstorm last year, and I'm in the process of sanding them. On top of the table, I potted a citronella plant. It smells wonderful, and supposedly rubbing the leaves on your skin keeps the bugs away. We'll see about that. 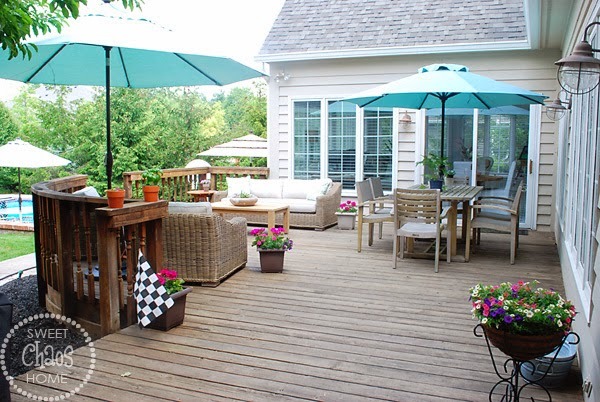 Our deck gets pretty hot during the day, so umbrellas are essential. The large one over the lounge chairs was from the Frontgate outlet a couple of years ago. I found the smaller one at Lowe's last week. I think they coordinate rather well. We are really enjoying our new outdoor room! Hoping Mother Nature gives us plenty of nice days to enjoy it. 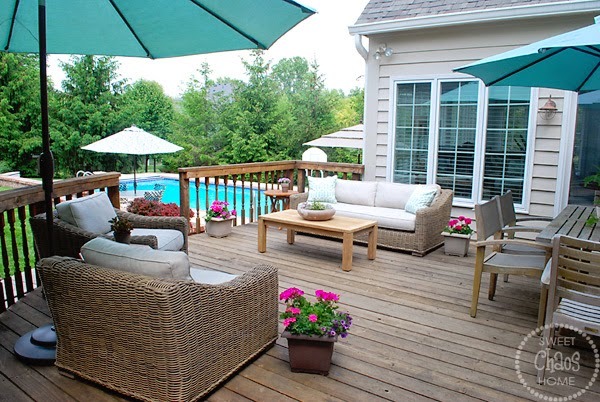 It's gorgeous, your new furniture is fantastic and that pool looks so inviting too. 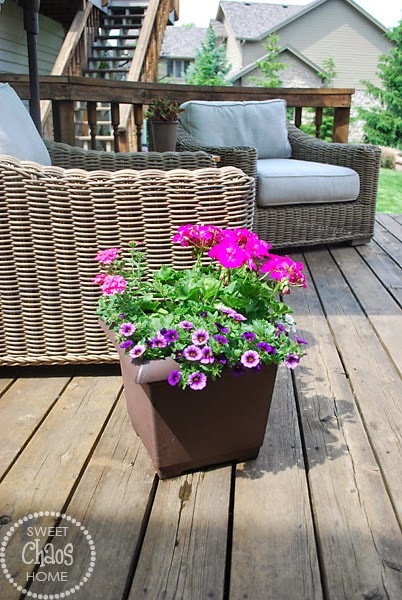 Looks wonderful.Here in North Central Florida, the sun gets pretty brutal in the height of summer, and the patio furniture and plants suffer. This outdoor room is gorgeous!! 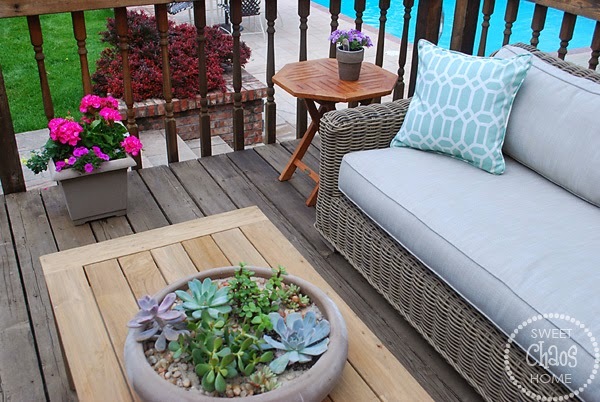 Carolyn, Your outdoor room is gorgeous. I love your new furniture...it's a perfect fit for lounging and relaxing. I have always loved umbrellas. We have a hard time with them here because of the wind off the bay. Gorgeous! Dont you have to take the cushions in when it rains? i've had experience with cushions and they take forever to dry after it rains. Beautiful furniture, though. what a great spot, looove your new seating. let me know how the citronella works for you, will ya? we just did a patio so i'm hoping to spend more time outside this year, as opposed to my non bug having sunroom! 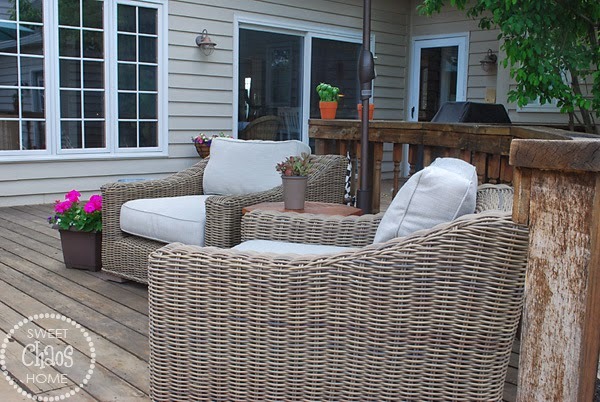 Your outdoor room looks so comfy and inviting! I hope we can put together equally as pretty when we get our new place. Your garden room is lovely. We spend about 10 months of the year using our outdoor room. I wish we had space for the beautiful furniture you chose from RH. Hi - Love your looks! Did you get the Classic or Luxe from RH and what size is this sofa? Thank you!!! 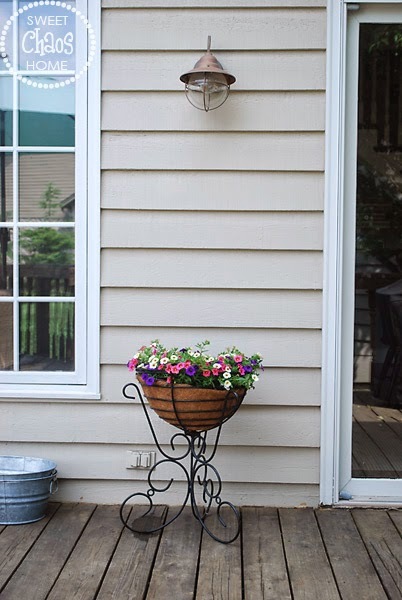 Choosing Exterior Paint Colors -- Help Wanted!